Ronny Deila admitted Celtic "didn't do anything right" as they dropped two points to Dundee and saw their lead cut at the top of the Scottish Premiership. The visitors were worthy of a point and almost won the game late on, prompting home fans to boo the players off. "It was a poor performance from start to finish all over the pitch," said Deila after a second successive draw. "We looked slow and were always a metre late. It is about getting energy back. It seemed they had flat batteries." With Aberdeen beating Dundee United 1-0 at Tannadice, Celtic's grip on the championship lessened slightly. 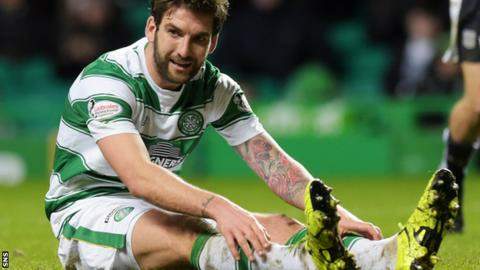 Supporters were more dismayed with the level of the performance, with Charlie Mulgrew coming closest to scoring in the second half, only for Scott Bain to push the ball away. "The performance was not good enough," Deila admitted. "Everybody in the dressing room agrees with that. "It is my responsibility to lift everyone as a group and get strong again. We need to get back on track on Sunday. [against Greenock Morton in the Scottish Cup quarter-finals]." Deila insists, though, he remains the right man for Celtic in the long term and that the title is still Celtic's to win. "I believe that we can turn this around," he said. "Everybody goes through hard periods, but still we are top and we're going to bounce back again and win this league." Dundee manager Paul Hartley praised his players for their work rate and application, having sent them out in an unfamiliar 3-5-2 shape. They grew in stature as the game progressed, with Juilen Extabeguren, Paul McGinn, Paul McGowan, Nick Ross, Cammy Kerr and Craig Wighton all impressing. The point, and the performance, will also provide further confidence ahead of Saturday's trip to Ibrox to face Rangers in their Scottish Cup quarter-final. "The game plan worked well," Hartley said. "We changed our system and went to a back three with two wing-backs, and we took the game to Celtic. "[The players were] outstanding, a magnificent bunch to work with. We only sprung that system on them yesterday, but they took it on board and I felt we had a real team performance. We outfought Celtic. "It's a massive game for us on Saturday, we're up against a good Rangers team, but it's one that we will go and try to do well in."